Discover if HubSpot CRM is the best CRM Software for your company. So…what is HubSpot CRM? In this Definitive Review, the EntrepreneursGateway.com team test it to the MAX! Will HubSpot enable you to manage your pipeline with total visibility? What about tracking customer interactions automatically? Can you see everything about a lead all in one place? Is HubSpot the MOST powerful CRM we’ve ever seen? HubSpot is a great CRM for B2B, sales automation, and lead generation. 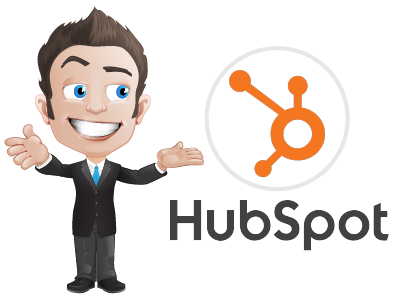 HubSpot is the only Free CRM software you will find on the Market!! HubSpot was fairly easy to use and to link everything to everything else; having said that some of the processes were a little confusing. ​You need an account to talk to anyone or use their social platforms, which was a little disappointing. Is HubSpot the right CRM for you? Are you looking for a more efficient way to manage and grow your business? Well, you can start by using the right customer relationship management (CRM) software. One that will make a difference to both you and your company. Whether you are looking for a free version to fit in with your budget or a simple one that is designed for small businesses – don’t worry and keep reading as there will be a CRM system that is right for you. HubSpot is up there with the best CRMs, especially as it will not cost you a penny. It also branches off to other pieces of software that are also free for your use! In this review, we will look at the features and benefits that HubSpot offers so that you have a better understanding of how it works and whether it is the perfect CRM software for both you and your business. So, are you ready? Good, lets dive in and get on with it!! I will put HubSpot through our rigorous testing and will look at the following aspects. Performance: How does HubSpot perform and what features do they offer to help create the perfect CRM? Usability – Does HubSpot offer everything necessary that users expect from CRM software? Support: Does HubSpot offer quick customer support solutions and help, and can you count on them when it matters most? Cost – Does HubSpot offer the best pricing in the marketplace? AND more importantly, what deals are available that can help you save money? Which means, if you have a small budget – or even NO budget and are just starting out, then HubSpot is a perfect choice. At present, it is the only FREE CRM available that has several applications that can be used together with the CRM, which all come under HubSpot’s umbrella, which in turn makes your life a little easier. Of course, like anything in life, there are some drawbacks, especially around processes, which can be rather time-consuming and end up requiring more resources than you may have available. More importantly though, how did HubSpot fare against our must haves? Let’s head on over and have a look…. HubSpot CRM is a powerful and restless automation system which helps businesses to close deals quicker and reduce the amount of time spent on arranging customer documentation. 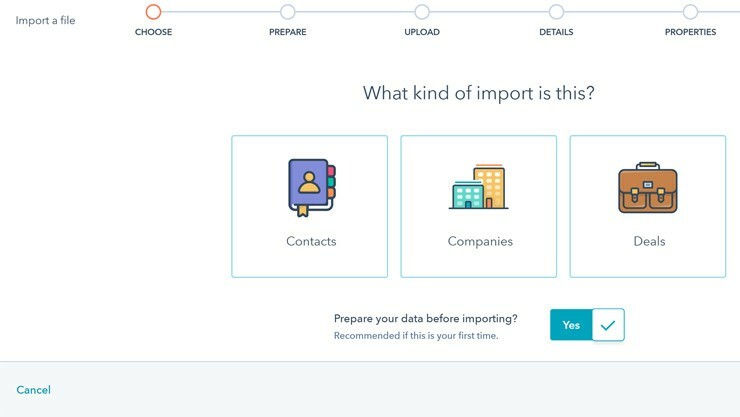 It also offers some really powerful data enrichment functionalities, such as giving you the capability to import leads from emails with just one click. It houses many features, and as already mentioned, the most obvious and number one is what makes it stand out from all other CRMs (have you guessed what it is yet!!). In this section, you will learn about some of the most used features that HubSpot offers to help you to automate your marketing and grow your business. But, what can it do? More like what can’t it do (sorry about the cliché!). It can near enough do anything you need it to. It can store contacts together with all the back history of any contact that has previously been uploaded to the system. But what makes it special? 1. 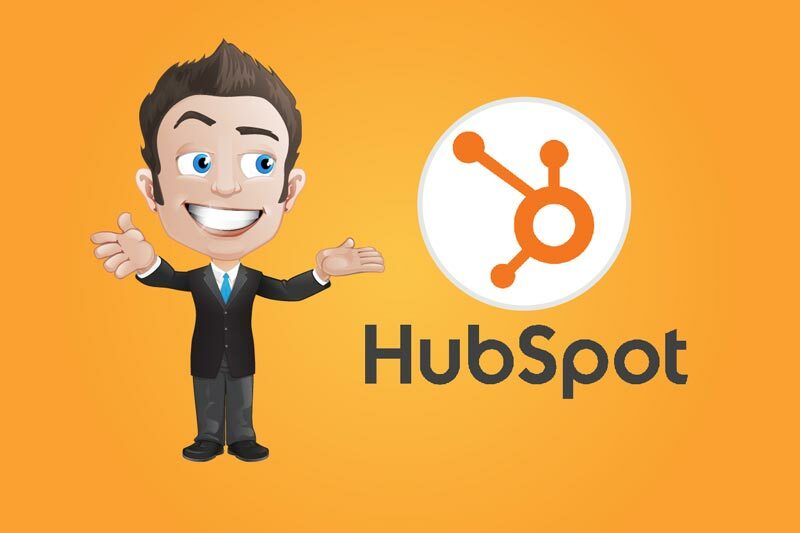 HubSpot is FREE and readily available for download. You don’t need to think about setting up a separate budget to enhance the performance of your team and your business. 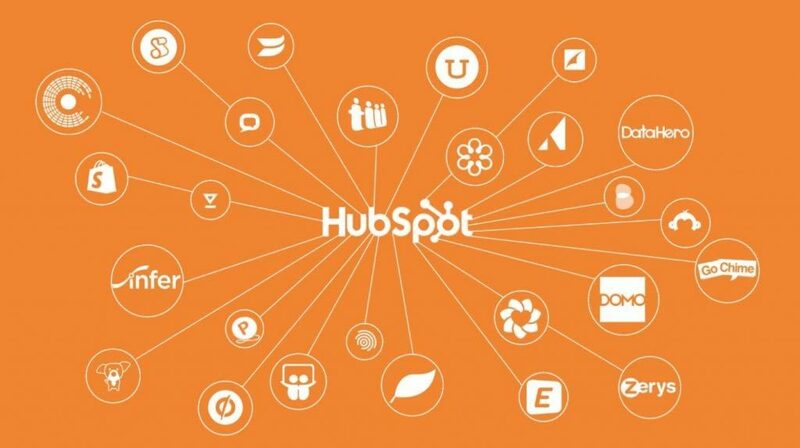 Use HubSpot at zero cost and enjoy the many integrations with other business systems to benefit your business. 2. HubSpot can link you to all aspects of the sales processes. This should be the number one advantage of using HubSpot in your business. But there can only be one ‘number one’. Anyway, the ability to link your CRM to all your sales processes is a HUGE advantage for your business…especially when making development plans, particularly client expansions and sales growth. HubSpot is an ideal solution for any type of business – manufacturing, retail, supply, service industries, etc. 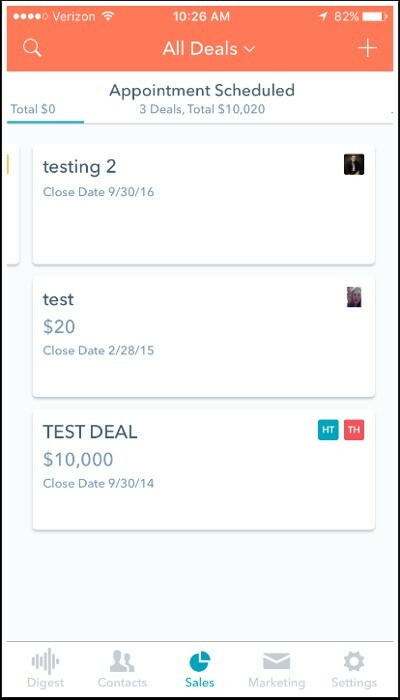 It will help you close deals, with so much less effort for you and your team. Less effort is required because it seamlessly organizes and manages everything in your sales pipelines… including the Insights, which will save you time and money spent on research, trials, and errors. HubSpot can save as many as 100,000 contacts and users, with the benefit of its UNLIMITED data storage system. After downloading and installing, HubSpot will be in the background, running, as it integrates all your data. 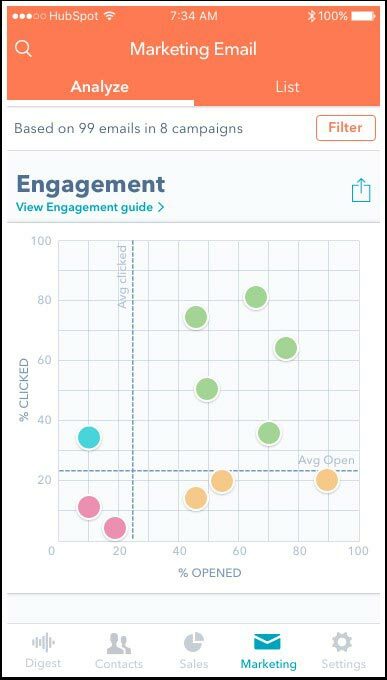 A simple trigger will take you to HubSpot where you will be able to view the Insights and Reports it has created. You will not have to modify settings of your other apps as HubSpot simply blends right into your sales processes and operations. I mean it when I say HubSpot aims to help businesses increase their profits. No training and complicated setup or installation required. HubSpot features an add-on which is named sidekick and is actually very good. It enables you to track your emails, so you can see when they were opened, and if any links on the email were clicked on. Emails can be stored directly on to the CRM, which means you will have a copy of your contact when you begin a new email to someone, plus it will display a sidebar which will show the last contact that you had with them so that you can see the date that you last sent one and whether it was opened. This also links into their twitter account, so you can view their recent updates if you so wish. Sidekick will also help you prospect as well as email. 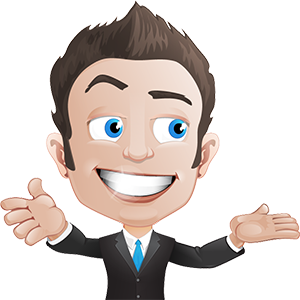 If you visit a prospect website, you will see a small sidekick symbol which is located in the right-hand corner. Once you click on this, a sidebar will appear, where you are able to save the contact information and website too – directly onto the CRM. Information that is already stored on the CRM about the company can also be viewed. Verdict: HubSpot works non-stop to automate your whole system, guide your sales team, motivate and build lasting relationships with your customers. Put simply it assists you in managing your business. HubSpot is the free assistant you’ve always wanted - what’s more, it doesn’t complain. Imagine this; you have finally found a CRM that includes all the features that you have been looking for and need, then, rather painfully you discover that you need a degree to simply begin the setup process. Of course, most software’s do take time to learn, but nobody wants to spend months just trying to get started. Also, if you find that you are paddling upstream, what help and support is available to put you back on the straight and narrow? In this section, we will look at how easy HubSpot is to use and what help and support are available if you find yourself drifting upstream. So, without further ado, let’s see how user-friendly HubSpot is, ok? Fortunately, (for both you and me!! ), HubSpot is exceptionally easy to use. It works by linking everything to everything else, e.g., contacts to clients, then clients to deals and tasks to contacts and so forth. Everything is fully customizable, which creates a bespoke CRM, and which means every section is used. Everything can be viewed and accessed by all, which is great, but I could understand that with larger companies this mightn’t be practical (there is, however, an option to pay for user accounts which might be more suited to bigger companies). More good news; the installation was easy and didn’t involve me having to sit on the phone to the company, or for them to remotely control my PC. The process was fast and straightforward. 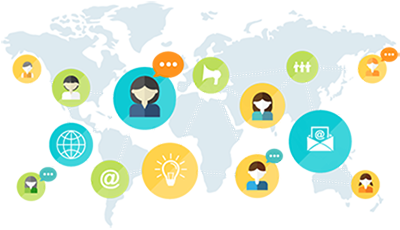 On the free version of the CRM the data is open to all listed users; however, tasks and contacts are still able to be assigned to each individual user. The primary user will punch in the emails of all the other users, which will then add them to the system which will then send them a lovely welcome email together with an introductory video to explain what’s happening – I thought this was a really nice touch and a very sensible idea. But, what about uploading data? Now, this will work differently for different users. To begin with, I only wanted to manually input primary clients into the system. When it came to input a larger contacts list though, I used the import function which is located on the contacts page, which made this task quick and easy. What I really liked though, was that if there were any errors, they were returned to me in a report format, which meant that I could amend them immediately. I would say the most annoying part of the whole process was the preparation of the data! Let me guess; you’re thinking, ah but what were the problems? Well, there was only one teeny weeny problem, and that was that when I was manually uploading the jobs when I reached around the 50 mark, the system began to lag, and it was difficult to add more until a little later on. I’m confident that this won’t be an ongoing problem though as 99% of the time I won’t be mass uploading jobs. I think what made it worse was that prior to this the system was extremely fast. The implementation of many different apps into HubSpot can also be a disadvantage as some may find it confusing and overwhelming to see so many processes all in one place. However, putting aside the implementation issue, HubSpot CRM works best for B2B companies that have target markets. Some companies may find it complicated, as some of HubSpot’s processes are better suited to businesses with straightforward defined markets. Adding an additional domain may get in the way of an existing domain. So, to get around this issue, you would need an Admin person to manually merge the new domain with the existing data. You need to be sure that running a business to business deals model is the best solution for your target market. B2B works best when dealing with small to medium-sized businesses. In conclusion, HubSpot CRM is not perfect…there is no CRM that can solve ALL business problems. Most HubSpot users find that for the CRM to become beneficial, they required third-party software; some of these are free, some must be purchased. In order to keep their products free, HubSpot does limit its email and phone support to its paying customers. However, if you are a free user then don’t panic, as help is at hand via the HubSpot community which is manned by another user of HubSpot, employees, and partners. I must admit that this was a slight worry for me – being a UK user. I did hyperventilate ever so slightly when I couldn’t see any obvious number to call when I began to drift upstream. However, there is an integrated help feature within the CRM which meant I was able to type in my problem, which then got directed to the correct support member for that specific issue, who then emailed me back the solution. What I also liked was that I was even able to suggest system features!! Verdict: HubSpot is extremely easy to set up and use, and although users do need an account to access some forms of support, there is still FREE help available. In today’s digital world, it really is important to have a CRM that is mobile responsive. I mean, who doesn’t want the opportunity to work while on the go or on holiday!! Come on, let’s check it out, ok? 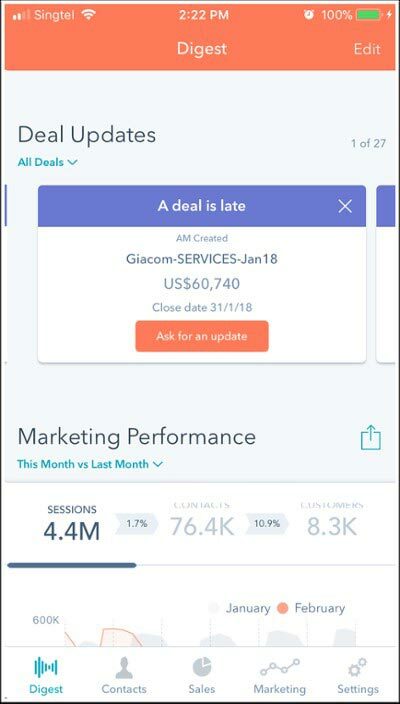 So, HubSpot’s mobile app for iOS gives you access to sales and marketing tools and data, whereas the Android app only gives CRM data access (as yet no marketing). When you have logged in, you will be able to access numerous reports in the ‘digest’ view as well as update companies and contacts in ‘contacts,’ deals can be monitored in ‘sales’ and email engagement in ‘marketing’ as well as managing your settings. 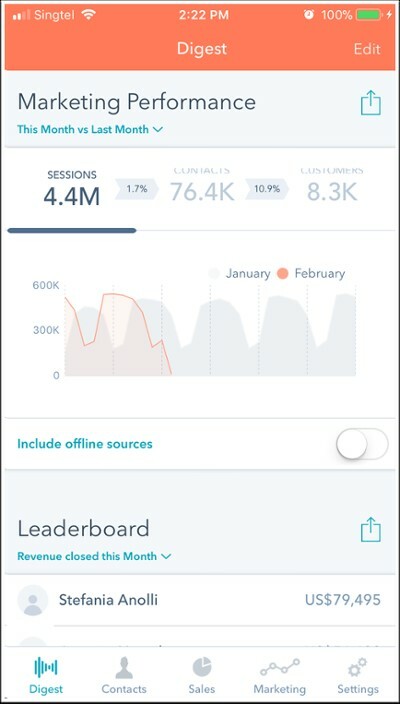 Keep in mind though, when you are in HubSpot’s mobile app you will only be able to view the tools that you have access to, which is based on your user role. 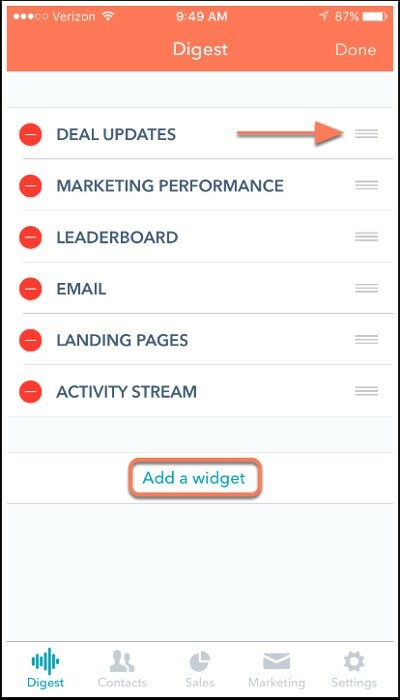 The first time that you log in using HubSpot’s mobile app you will have the option to select which widgets you want to be displayed in your ‘digest’ – this screen can also be customized to display information relating to HubSpot’s CRM and sales, productivity, and marketing. If at any time, you wish to remove, add or re-order the widgets onto the digest screen, then just click on the ‘edit widgets’ button at the bottom of the screen or alternatively click on the ‘edit’ button which is located in the top right-hand corner. With mobile email reports, the power of HubSpot’s email analytics is placed directly into your hand. 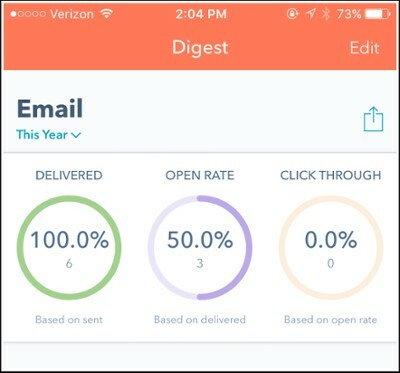 You will be able to measure your email’s success by looking at the open and delivery rates and click within a specific time frame. 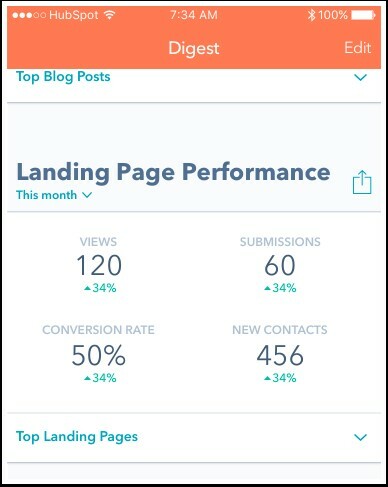 With the HubSpot mobile app, you will be able to analyze the performance of your landing page – all while on the move. From here you will be able to see submissions, views, conversions (%) and any new contacts. By clicking on the dropdown menu, you will also be able to view your top landing pages. 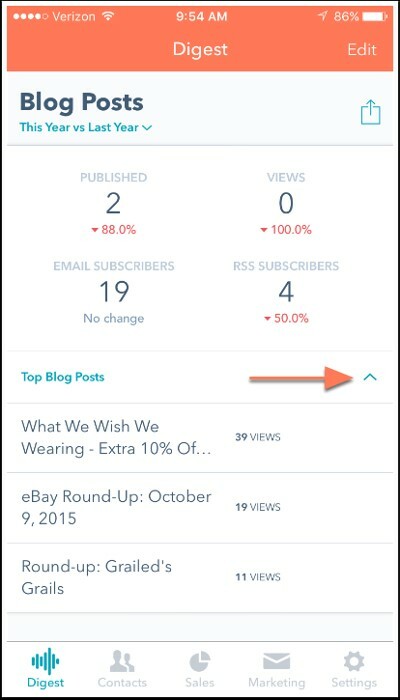 HubSpot’s mobile app also enables you to analyze how well your blog posts are performing, as well as the number of published posts and the top ones across a specific date range. Fancy being able to check on any open deals from within your digest? Well, with the mobile app you can. You are able to view each deal and see what stage they are in as well as being able to ask for an update via the deal owner!! Pretty impressive HubSpot!! Scrolling through the deals is as easy as swiping left or right. The leaderboard will be able to rank your sales reps by various factors, including emails sent, revenue closed, weighted deal totals, meetings booked for today, the week, months, quarter or year and the number of calls made. 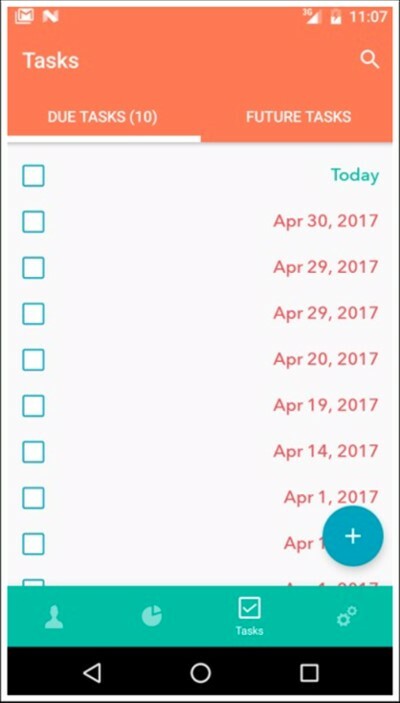 The ‘tasks’ widget is where you can view any assigned tasks, as well as sort them in order of priority. 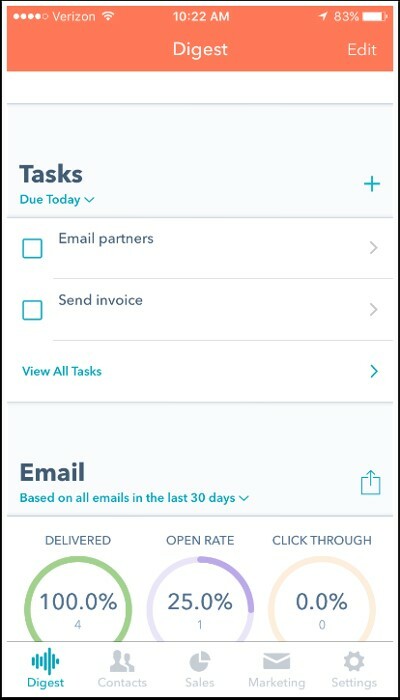 New tasks can also be added by clicking on the +, edit or mark button and tasks can be marked as being completed by clicking on the existing task’s checkbox. You can monitor recent HubSpot sales activity by using the activity stream widget. This is also where you can view and filter unopened emails. 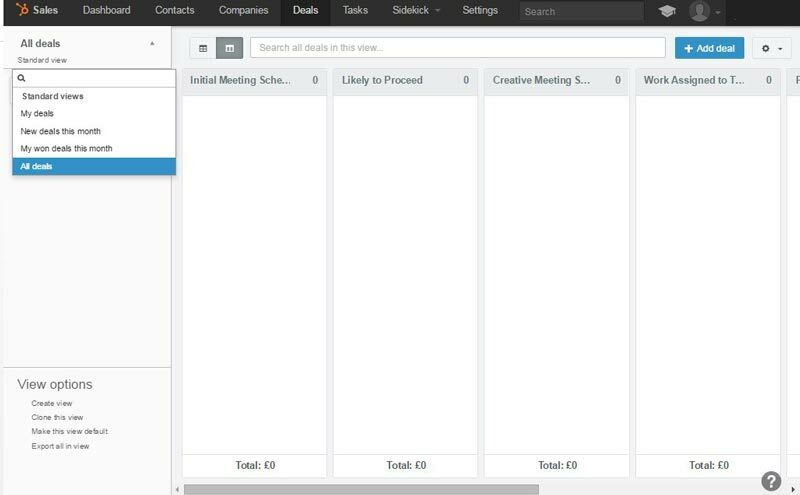 You will also be able to view other sales engagements such as meetings and calls. This helps you to stay on top of your leads from your mobile device. Manually add a new company or contact. Alter any existing company’s or contacts properties (simply click on the ‘properties’ tab. Link a company to a contact. Send a tracked email, call or send a text message to contacts by using the icon located underneath their photo. Include a note, task or activity onto a company’s or contacts record. 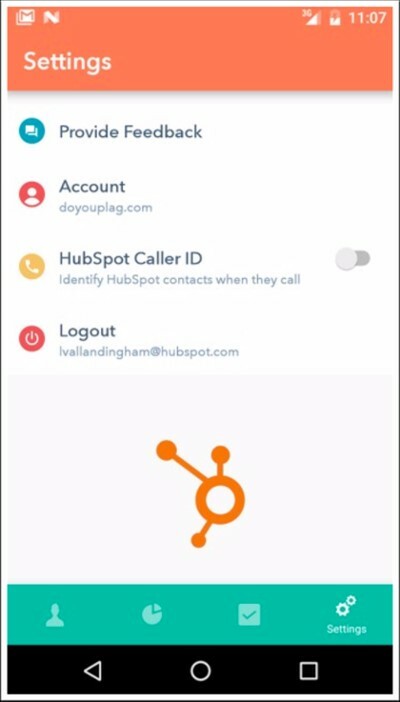 With HubSpot’s mobile app you will have the ability to filter your companies and contacts based on the saved filters within the CRM. However, you can’t create save filters from inside the app. 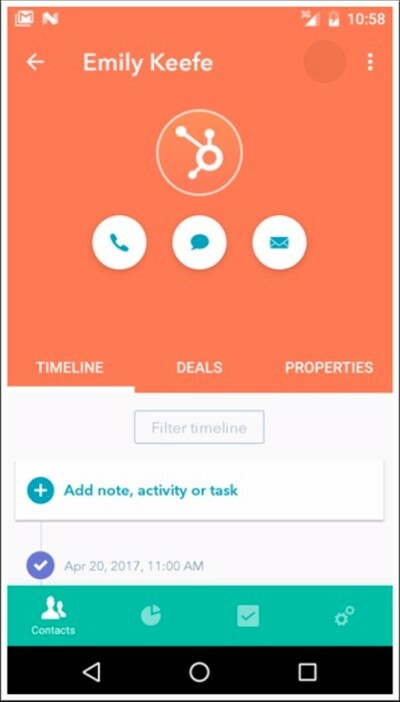 So, by clicking on the ‘sales’ section of the HubSpot’s mobile app, you will be able to view each deal in its separate stage. 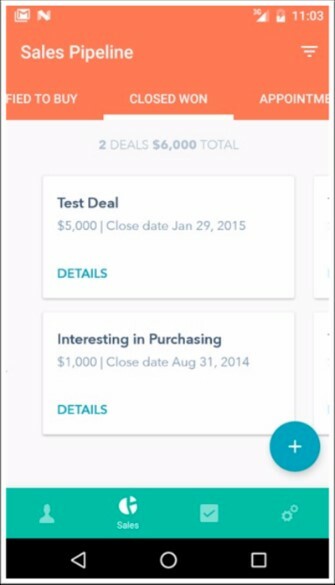 By swiping left and right you will be able to see existing deals in each stage. To create a new deal, click on the + icon which is located in the top right-hand corner and to view the timeline of a deal, simply click on it. You are able to dig deeper into marketing email metrics directly from your mobile device. By using the ‘analyze’ tab, you will be able to see your email engagement, monitor the deliverability and view lost contacts as well as measure the number of opens and clicks per device. 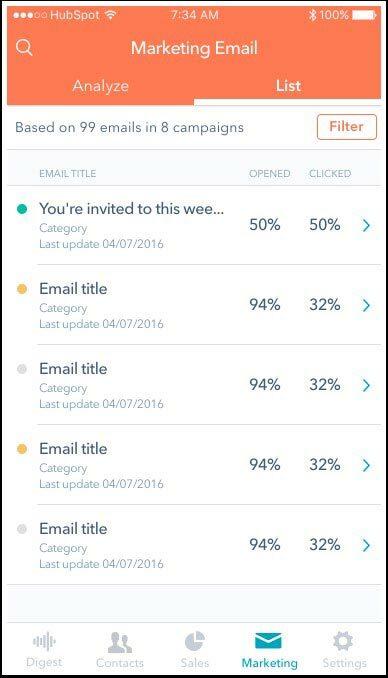 The ‘list’ tab will enable you to be able to view opened and clicked rates for every individual email across a specific date range. 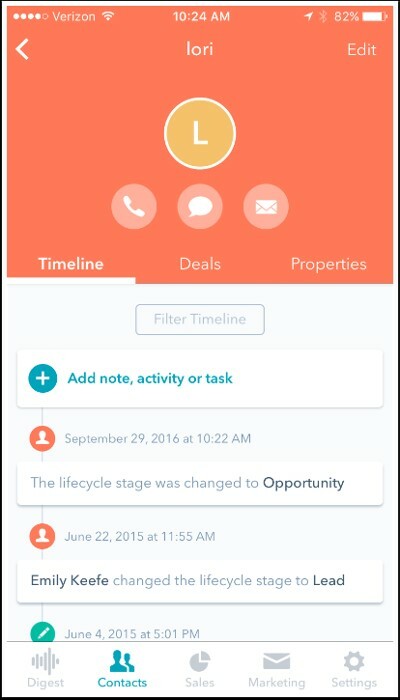 So, by using the Android version of HubSpot’s mobile app, you can interact with all of your tasks within the CRM. 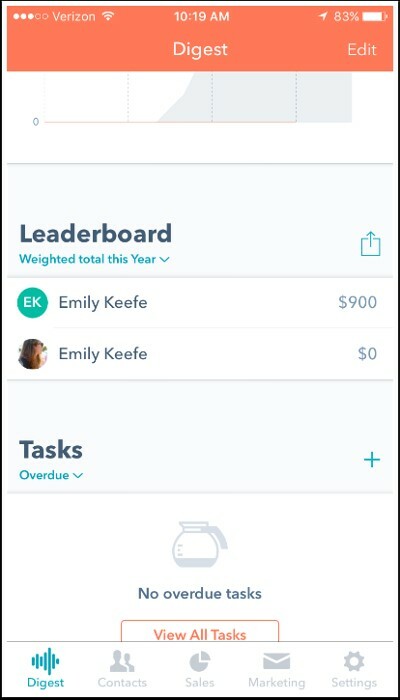 New tasks can be created by clicking on the ‘plus icon’ and via the tasks screen, due and future tasks can be viewed. 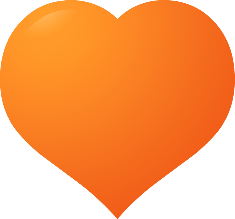 Receive help from HubSpot’s support team. Adjust the default mail client for any emails that are sent from the mobile app. 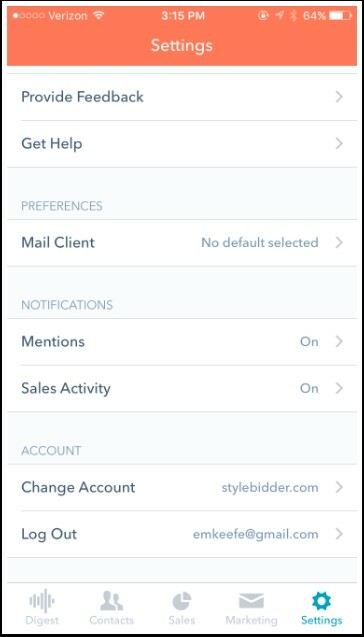 Change your notification settings for any @ mentions and Sales activities. Turn on/off the Caller ID feature. Verdict: Well, what can I say, HubSpot certainly provides some amazing features for both iOS and Android users with their mobile app which almost rivals their desktop version!! In this section, we will look at what apps, services, add-ons, and campaigns are on offer when using HubSpot. Do they live up to expectations or are they as useful as sunglasses on a rainy UK day? Let’s crack on and find out, ok? The HubSpot software works well with Shopify, which is also free. Other tools that can be integrated are Microsoft Dynamics 365, Zapier, and Salesforce CRM. There is a much bigger array of tools in the HubSpot market that can be readily integrated into HubSpot to enhance its efficiency as a Customer Relationship Management solution. HubSpot has several available options when integrating with CRMs. It offers Zapier and Salesforce native integrations together with a third-party service that does offer simple API integration including in excess of 250 services. HubSpot has several partners that are able to work with you to help build a bespoke CRM integration. Now, let me introduce you to ‘HubSpot Marketing.’ This is seriously advanced software in terms of aligning the marketing campaigns of your business and the CRM. It is designed to increase the traffic on your site and raise the rate of converting site visitors into warm leads. These leads will become paying customers, and with the right customer service from your team, they will be returning customers. But, how does HubSpot do all these amazing things? It is a system that works with proven lead generation strategies to increase your successful conversion rates. It encourages your team to improve their site content and to ensure that it is displayed to the correct target market – the appropriate audiences and influencers to enhance and build your company profile. What the HubSpot market displays are CRM integration for quite a few of the popular CRM systems, such as Infusionsoft, Highrise CRM, Microsoft Dynamics, Nimble, NetSuite CRM, SugarCRM, Zoho, and Saleforce.com. What you need to be aware of though, is some of the CRM integrations (SugarCRM and Salesforce) are supported via HubSpot whereas others are supported via partners which means they may incur additional fees. And, as is the case with the majority of software applications which support data exchange with several CRM partners, the integration which is the strongest clearly lies with Salesfirece.com. 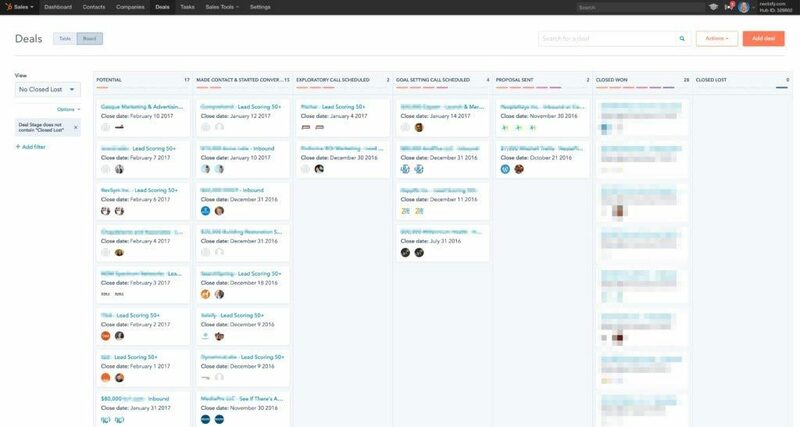 At the moment, HubSpot is using version 3 of its Salesforce connector which is built on the Force.com platform and is part of AppExchange. 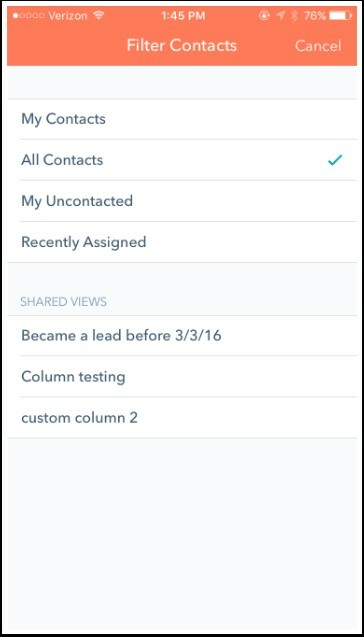 HubSpot is able to sync both the contact record data or lead with Salesforce.com and then illustrate this data in sections called ‘contact information’ (for contact data) and ‘salesforce information’ (for account data. 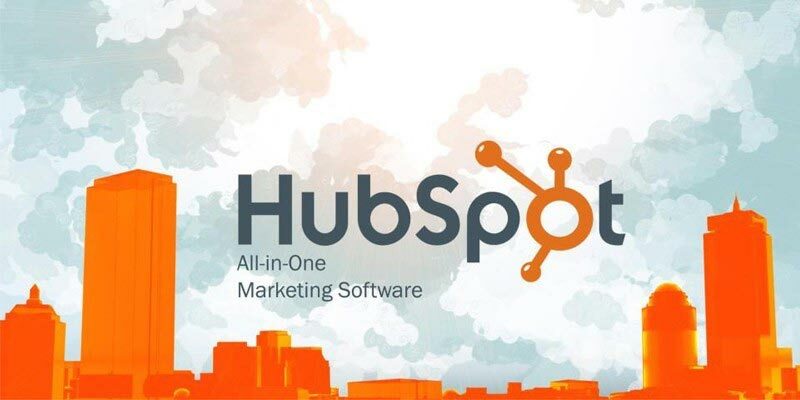 Although the integration is a bi-directional sync of both contacts and leads, HubSpot is able to sync campaign profiles which then impact HubSpot’s capability of generating marketing reporting from the CRM system. HubSpot’s contact record field will be overridden by updates from Salesforce.com, but Salesforce records will not be overridden by HubSpot data updates. Even with perfectly adequate CRM integration, sales staff are still unable to send emails via their Gmail or Outlook system and have them synced with HubSpot’s lead record. Because HubSpot doesn’t support real-time sales alerts, this means that sales staff aren’t notified when named accounts or contacts are interacting with the web, which is a bit of a setback. Verdict: HubSpot is it is one of the Best CRM systems that can be integrated with other applications and software and is the only FREE CRM that offers this level of integration. So, let’s have a look at what analytics and reports HubSpot has to offer to ensure that you are always be kept in the loop. I have found that the reports in other CRMs to be tedious to create and never really covered everything I needed and certainly not from one place. But, you will be pleased to know that HubSpot CRM does offer a whole host of reports that are activity related, including performance and how many contacts are created each day. Paid accounts are also able to create custom reports. HubSpot is durable in delivering the reports that matter the most to marketers, like what content they consumed, how the leads ‘found’ you, which efforts attracted the most qualified leads, and which are the top campaign performers. HubSpot is also very good at comparing the campaigns via the use of equivalent metrics such as leads, conversions and customer acquisitions. Now, although HubSpot’s marketing reporting does work in tandem with the CRM integration of choice, the benefit of the full analytics is only obtainable via a combination of integrated CRM software and marketing. HubSpot customers that don’t have an integrated CRM system can manually designate both open and closed sales opportunities onto their own lead management page. This is the first page and is where the reports are located. Here you can set monthly quota’s or targets; then as jobs are added, it updates you as to how close you are to your target. The jobs are color-coded by how far advanced they are, which is really useful because at a quick glance you can tell where you are for the month. Now, if you prefer or need a more in-depth breakdown, just click on the job and it will all be broken down. This means that a glance you are able to view your productivity and pipeline how much/little has been done compared, for example to last month. Verdict: HubSpot has a good range of activity-based reports which cover everything – and all from one screen. Remember, HubSpot may not be the right CRM for everyone, so let’s try to get down to who precisely this tool is going to be suitable for. Well, what can I say, HubSpot is the budget marketers dream because it is FREE!! You can have your cake and eat it!! Even if you find that eventually, you may require some customization, then simply move onto a new CRM or take a look at some of HubSpot’s products to see if they suit your needs. Because HubSpot is so easy to use and navigate it is perfect for beginners. There are also various help, and support options available allows for peace of mind. HubSpot CRM is great for high-level users, who are looking to log contact information, leads and customer interactions. On top of that, it also provides basic sales funnels which makes it an ideal tool. Well, that’s it. I’m now nearing towards the end of this review, and I hope that it has given you an overall idea what HubSpot has to offer. I’m guessing that the final and most important question is – Is it THE ONE, I mean the CRM for YOU and your WEBSITE? Both small and medium-sized companies will love HubSpot, because it is a premier and certified Google partner, and is CRM solution which has been welcomed by lots of different niche businesses and industries. Start-up businesses should also take advantage of this opportunity and try out the smart, sophisticated way of marketing and sales management for FREE. No need for capital investment!! HubSpot is such a simple but elusive idea – gives the customer what they want – which is amazing content which will educate them and help them with their purchase process, then those customers, will, in turn, engage with the supplier. There has been an undeniable shift in the purchasing power which has gone from seller to buyer. 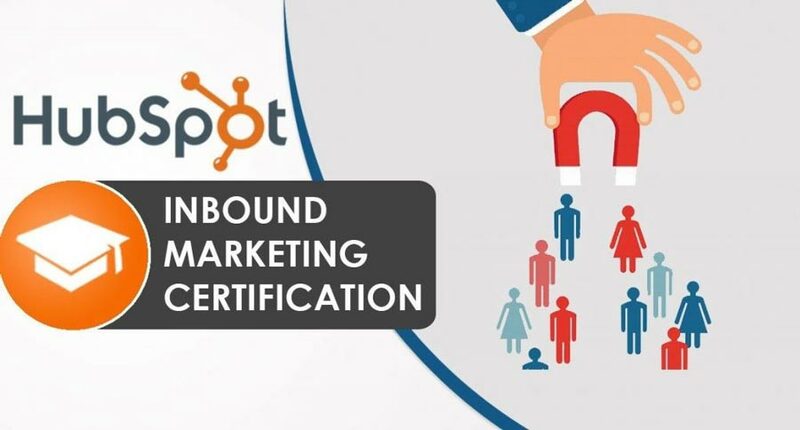 The aim of HubSpot is to provide the advice and tools to replace the completely ineffective outbound marketing techniques with inbound marketing and captivating content. HubSpot’s approach to inbound marketing has powered growth which has been achievable by a few competitors. I must admit, it is pretty rare to see the level of success and hyper-growth that HubSpot is currently experiencing and I don’t see any sign of it slowing down any time soon.